People get uncomfortable when they hear me say this. ​Then I say, “This is not a goal statement and please don’t mistake this for arrogance. This is a statement of belief. It is happening.” At this point, people usually do one of two things, they either get super uncomfortable and try to move towards talking to someone else (the majority of people) or, some people ask me how I plan to do it (the rare few). This post will be polarizing. After this post, some of you won’t ever read my stuff again and some of you will double down and start reading more. People get uncomfortable with statements like ‘being the best in the world’ because most people are comfortable with average. They think, “If I can be ‘good enough’ I will be comfortable and get decent results and that will be just fine. Maybe I’ll learn a couple of things and get a ‘meets objectives’ on my next performance review. I’m not the best, but I’m also not the worst. And that’s ‘good enough'”. But the truth is that the cult of mediocrity is cruel and oppressive. Way more cruel and oppressive than the cult of greatness. People believe that shooting for ‘good enough’ is good enough. But it’s not. There is more competition to be average than there is to be great. Sounds weird right? Being great is difficult, true, but there’s way less competition. 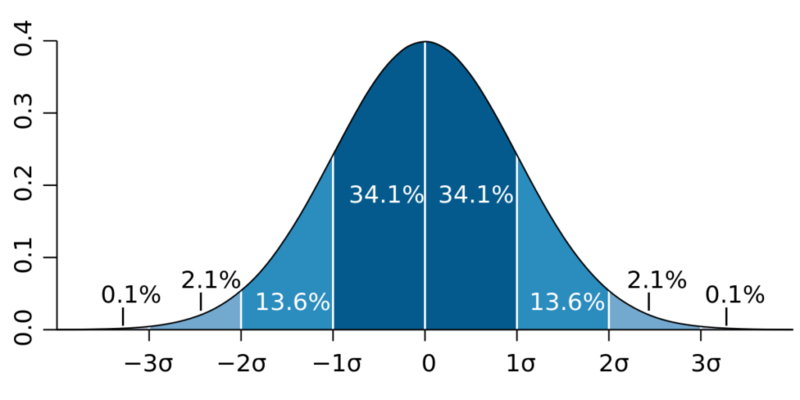 If we assume normal distribution (see Figure 1), ~68% of people sit within one standard deviation of the mean (average). And then an additional ~27% of people are within 2 standard deviations of the mean. This means that most people (~95%) are average or below average. And so when people think, it’s okay to shoot for average, they’re saying, I’m okay with competing with 68%-95% of all people. This means that you’re actually competing with more people for a ‘meets objectives’ rating on your performance review than you would if you swing for the fences and went for ‘exceeds objectives’. And therein lies the insanity of shooting to be ‘good enough’. It’s actually totally illogical to shoot for ‘good enough’. So do you want to be great or would you rather compete with 95% of everyone else to be ‘good enough’. Do you want to be great? I mean truly great. Not just good or worse, good enough. Do you want to smash your negotiation goals, procurement metrics, sales quotas, and build truly amazing relationships? If you answered “yes”, here’s another uncomfortable truth: Sure, there’s less competition to be great, but that’s because it’s more difficult. It requires dedication and hard work, yes, but the most important thing it requires is the discipline of consistent and focused practice. Newsflash! You actually have to practice your skills to get better! You see I can teach you all the skills and strategy, but if you don’t use it and practice it, it’s USELESS. Another scary moment of truth: You’re wasting your time if you’re reading my stuff and not using it and practicing it. There go the readers. I can almost feel them. But it’s the truth. If you’re not going to use it, why waste your time and read it? Go use your time somewhere else. It’s the most valuable resource you have. But I’m really only interested in writing for the people that are still reading this. Be logical and choose greatness.